I thought I would take the name that one of the recent Faux Retreat students called the retreat after going home. Faux Boot Camp! 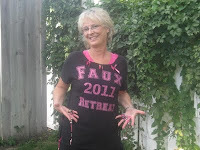 In fact Faux Camp will be the name of my new 3 day retreats! Anyway... I love finding new instructors, techniques and things that I think would make a good class. Because of this it is hard for me not to want to try to fit everything in. None of the classes are mandatory at the retreat, but who wants to miss out on something? After several months of planning, setting up, implementing (think camp councilor) and then going home after the retreats end, there is always, for me a sense of sadness. Then comes a few days catching up on sleep, unpacking and figuring out what to do next. The retreat started out with a welcome champagne and canvas class with Lori Franklin. Lori guided students in a French themed class which also included some handmade chocolates from 185Chocolat. Day two kicked off Donna Phelps 2 day class. 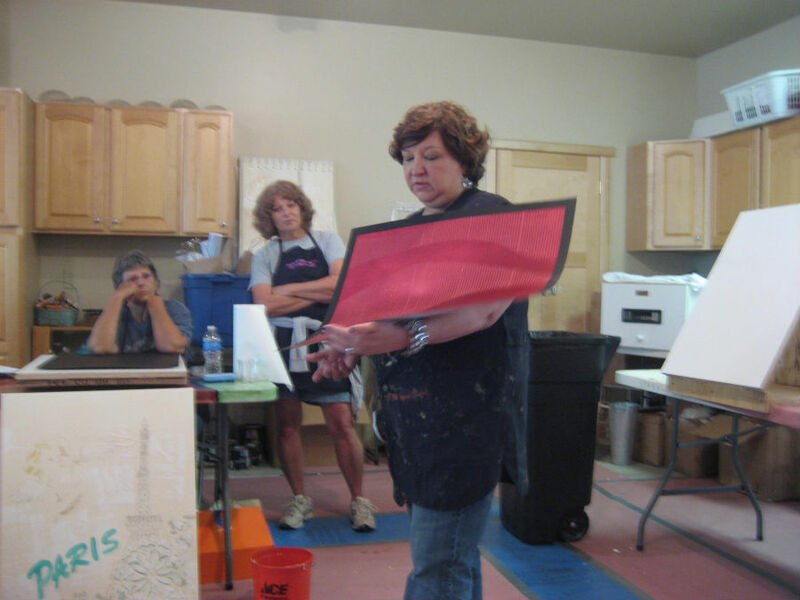 Donna taught students some beautiful and original finishes, some using foils and stencils from her personal lines. 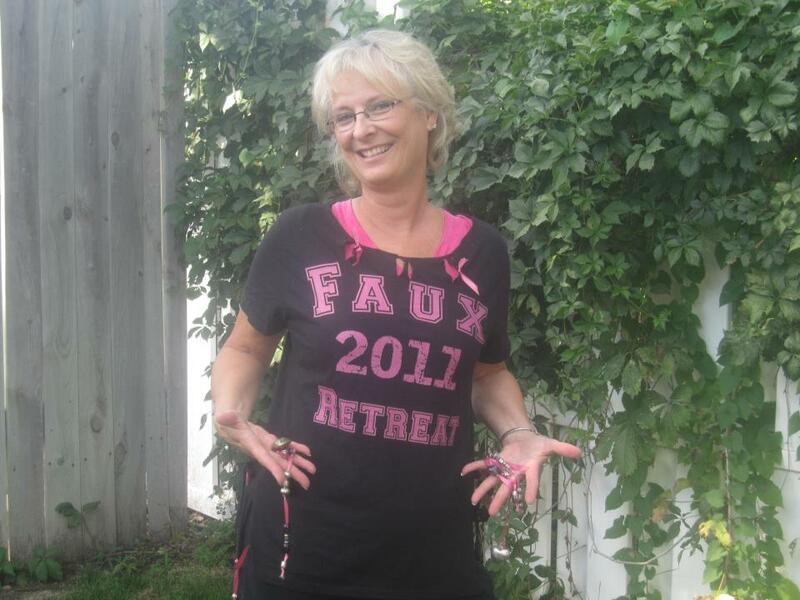 Many students commented on and appreciated Donna's attention to detail and her vast knowledge of the Faux Effects products she sells and uses. Donna commented several times on how nice it was for her just to be able to relax and enjoy the setting. 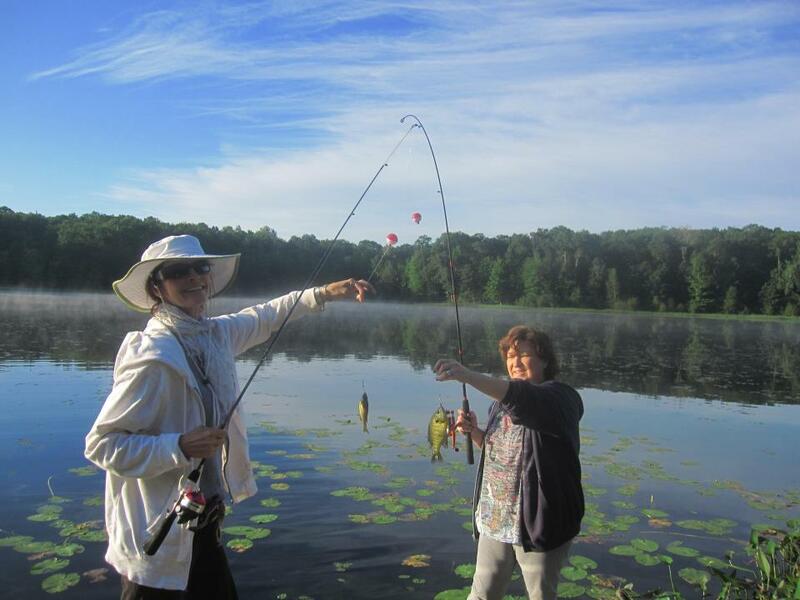 She also proved to be an avid fisherman. Donna also led an evening foil canvas class. It was fun to see what the students came up with using a variety of products, stencils and foils. Lots of talent in this group! Mave Alft kicked off day 3 and 4 with her fun Vertical Finishes class. Using products donated by Ed Mattingly of Sherwin Williams, Faux by Kathy and Proceed, Mave taught students some easy to execute but stunning finishes. This class also showed students a nice variety of products that can be obtained through a distributor or through your local paint store. When I first saw a canvas created by Joyce Nelson using composition ornaments earlier this year, I knew I had to have her teach a class using them. My feeling has always been, the more we as finishers have to offer in techniques and applications, the more sellable we are. Joyce guided students on how to use the ornaments on a canvas and also brought examples of what she had done using them on a pvc pipe and curtain rod. Everyone left with beautiful and sellable canvas. 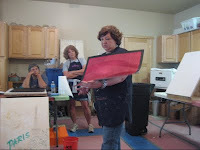 The last day Cindy Feddersen taught a cool range hood and back splash finish using iCoat concrete products. Cindy also led students in using the Metal Illusion product for floors and art pieces. 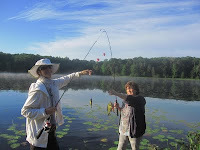 Cindy spent her non-teaching days assisting all the instructors with their classes. Evenings were spent playing games, talking, sitting around the campfire and an evening out to What the Heck. A few of the brave participated in morning Zumba dancing and most relaxed one of the evenings with a massage in the art barn. Feedback after the retreat from students has been wonderful, with even our one very brave guy saying he would do it all again next year. A very special thank you to the generous people who donated and/or discounted product, and prizes and goodies for the retreat. A couple of my friends went to this and said they had the best time. Can't wait to get to go to one myself some day. Great classes and lots of hard work by the amazing Kathy Boyd. I promise to not miss another one of these!